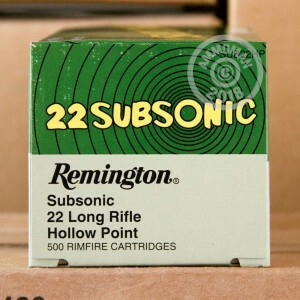 Grab this "brick" of 500 rounds in .22 LR for an economical, fun time at the range. 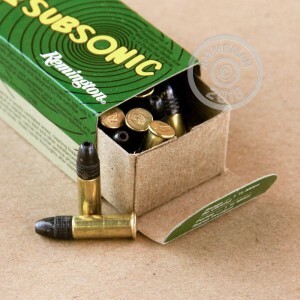 These cartridges fire a 38 grain lead hollow point bullet at a subsonic muzzle velocity of 1,050 feet per second. The hollow point also lends itself to pest control against small animals such as rabbits or squirrels. Remington ammunition is loaded in Lonoke, Arkansas. 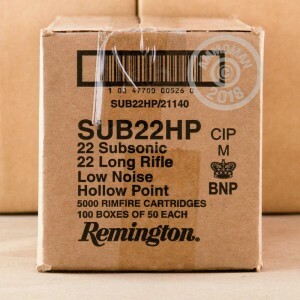 These cartridges use rimfire-primed brass cases and come in boxes of 50, with 10 boxes in each brick. Grab a few bricks and enjoy free shipping from AmmoMan.com, as with all orders over $99.